I don’t typically review books, here, but it felt right to do so, because I’m kind of infatuated with the novel, Grasshopper Jungle by Andrew Smith, which publishes tomorrow. Grasshopper Jungle is about small town Iowa becoming overrun by genetically engineered praying mantis, resulting in the apocalypse. I know, it sounds crazy, but there’s so much more to it than corn, Iowa, praying mantis, and more corn. It’s an awesome read about friendship and loyalty, with one extremely flawed protagonist––more on Austin in a minute. However, the story takes its time in developing the central conflict. There are hints of it, but most of the 128 pages prior to things really hitting the fan are filled with exposition and characterization, as well as a mix of secondary conflicts and accounts of history. And horniness. The protagonist, Austin, is very easily aroused, by everything: his girlfriend, his best friend, situations that make sense for arousal, and those that have no connection to sensuality. Yet, that’s his quirk, which, for me, made him an endearing character, in spite of his gross selfish interest. Really, he says he loves his girlfriend, Shan, and friend, Robby, but he has a very difficult time showing that love. Lust, on the other hand, is no issue for Austin. He’s filled with it. And such a distinction is important for teens to see. Yet, this combination of delayed action, which most authors (me included) would have concluded the first chapter with, and quite possibly an unlikable protagonist, could make Grasshopper Jungle a difficult read. But part of the undercurrent of the story is very much a Vonnegut-esque rhythm, of the renown “So it goes.” The looping style is part of the point. The story goes where the story goes, and unfolds as it does, without apology. I respect that and hope enough teens will have the patience to first know the characters and then watch them handle the main struggle. And I don’t feel as if we have to love all protagonists from the outset, or even throughout the novel. It’s important to learn from others, who we may not initially be able to relate to, because I can guarantee, on some level, at some point, the connection will occur. I’ve read reviews of Grasshopper Jungle questioning whether a female protagonist with the same quirk as Austin would be as positively received. It’s a good question. I don’t know if the YA world would be accepting of such, but I kind of feel that they would. Especially those who read Andrew Smith’s work. Winger, another Smith novel, handles homosexuality well, as does Grasshopper Jungle. Austin’s best friend, Robby, is gay, and Austin is…confused. He never labels himself bisexual, which I like, because at the end of the world, do we really need labels? If ever? So a female protagonist, unafraid to voice her desires, might excel, where Austin comes off as comical. Time will tell. 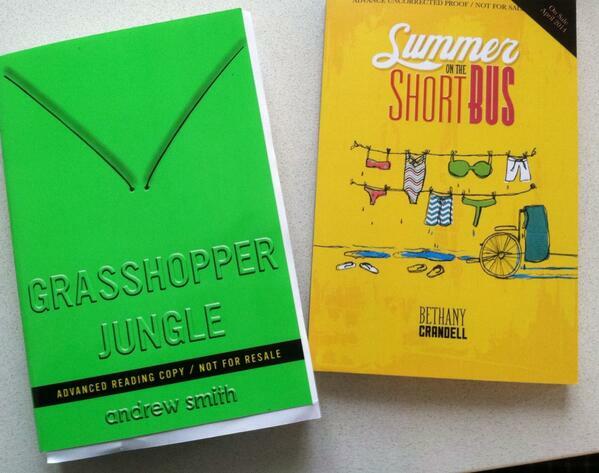 If you follow Andrew Smith on Twitter @marburyjack, he’s been tweeting pictures of excerpts from Grashopper Jungle. 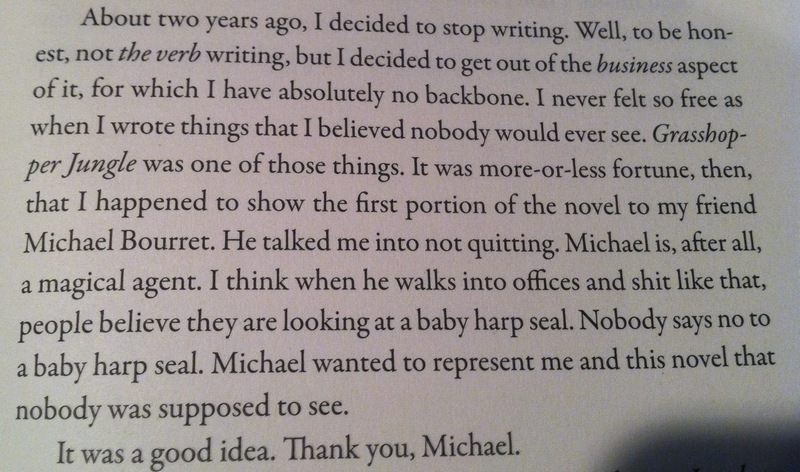 Here’s the most important one, from the Acknowledgements, which he may or may not tweet. I cannot imagine Winger or Grasshopper Jungle not existing, so I’m glad he wrote for himself and then let us see. Great review of a most excellent book. Thanks, Matthew. Glad you enjoyed. Oh. My. GOSH! I want to read this book. I have a B&N gift card burning a hole in my wallet so…yeah. This weekend, baby.